Advocacy can take many forms, from simple things like being out in the community every day so people have a chance to see and interact with someone who has an intellectual and/or developmental disability, to more complicated issues that require expertise and legislative action. Today we're looking at how advocacy plays out on a policy level and how The National Down Syndrome Society plays an important role in creating change at the federal and state level. This week, Josh and I participated in our first Buddy Walk® on Washington (#BWW2015) hosted by the NDSS. We got a chance to me Maryland Representative and member of the Down Syndrome Caucus, Chris Van Hollen. You can also hop over to Raise Expectations and say hi! If you're a regular here on The Road, you'll know that racial disparities and research are important to us. During the #BWW2015 over 150 advocates advocates from across the country met with over 100 Capitol Hill offices and talked about the NDSS legislative priorities for the year. This year, Down syndrome research is part of that list. It was a great opportunity to bring our specific concerns to the attention of lawmakers as one part of a larger agenda. We thank the NDSS for all their hard work - putting this event together and spending countless hours working in the political arena for the benefit of all people who have Down syndrome. If by chance you're not happy right now - we've got just what you need! Today we look at videos that include adults who have Down syndrome, and of course, we start with the one that went viral last year on World Down Syndrome Day. Okay, you can tell us, were you dancing or at least clapping along? The videos that get the most attention may have a catchy tune, or make us think about the possibilities for our loved one - or both! Today we look at grassroots advocacy and what can happen when - as Margaret Mead said and fictional President Bartlett borrowed- a small group of people become committed to change. Our guest blogger today, put down his camera long enough to write about the process of making "Justice For Ethan - The Movie" and what he sees as #EthansLegacy. Over the past year and a half this project has taken on a life of it's own. Documenting the progress and momentum created by advocates and legislators in Maryland has been incredibly rewarding. The search for answers has taken the place of accountability working toward addressing the lack of training our civil servants receive on how to interact with people with disabilities. Read on for more of his thoughts. E is for Evolution, and the story of the Down syndrome community is all about evolving. From the science to society's views, to the way we're able to connect and support each other - everything has changed dramatically in just one generation. The oldest organization in the United States serving children and adults with Down syndrome and their families... was founded in Chicago in 1960 by Kay McGee. What started out as the Mongoloid Development Council (MDC) in 1960 was changed to National Association for Down Syndrome (NADS) in 1972. When we talk about collaboration, we explore how people work together on a common goal. Families do this all of the time. In today’s A to Z Blog, we’ll look at how a father created a new model of “support” group to fulfill his own need to be involved with advocacy for his daughter. In most families, regardless of how they are composed, individuals share responsibility for the success and well-being of the unit as a whole. The work that needs to be done goes much more smoothly if all family members participate, chipping in with tasks they are able to complete. Repetition helps us become more efficient with each job, but we also need to be ready to handle new surprises and changes to our routine in order to survive. When we come up against a particularly difficult assignment, we ask for help within our immediate group first, but sometimes we have to go outside of that group to find answers. 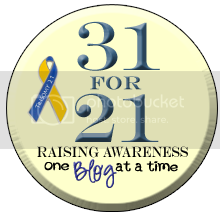 At this year’s 321eConference, the founder of Dads Appreciating Down Syndrome (D.A.D.S. ), Joe Mears, talked about how his need to be involved with advocacy for his daughter who has Down syndrome led him to create a new venue for service. Yes, I'm a Sesame Street fan from way back, and today as I was looking at photos on my news feed, this song popped in my head and wouldn't go away. We're so lucky to have social media to bring us together across great distances, but there's nothing like meeting face to face! In the Down syndrome community, we use the internet to form alliances and help each other reach goals. There are so many things we can do to help make the lives of those we love better and richer. Just about the only thing we can't do on the internet is give each other a big hug to show how grateful we are for the work they do. If he was here, what would Dr. Martin Luther King Jr. say and do about the current issues in our community? Today, as we celebrate Dr.King’s impact on our world, it’s a good time to reflect on our advocacy in the disability community. Most would agree that MLK would have something to say about the rallies and demonstrations around race and policing. Would he branch out and extend his hand to include the disability community in his work? I think he would. While some question, and even criticize efforts to widen the discussion of improved policing to include other disenfranchised groups, I believe Dr. King would be among the first to emphasize that #AllLivesMatter. It's been nearly two years since one of our own perished on the floor of his local movie theater. As the world joins the discussion about police interactions with the public, new attention has been given to our personal struggle. Ethan's case has been compared to that of Eric Garner, the man who was choked to death by police on Staten Island. Mr. Garner’s death recalls a similar tragedy involving a less familiar name: Robert Ethan Saylor, a 26-year-old man with Down syndrome who was killed last year in a struggle with three off-duty county sheriff’s deputies at a movie theater in Frederick County, Md. Mr. Saylor was overweight. The officers who killed him were just as inept as Officer Pantaleo and his gang, though with one key difference: When they realized that Mr. Saylor was in distress, they tried to save him. Still, their efforts came too late, because mere moments in a facedown arrest can be deadly. Yesterday, a video was uploaded to You Tube and tweeted with the #JusticeForEthan hashtag. The scenes with an animated representation of the struggle between Ethan and the deputies is difficult to watch, but the two minute+ video contains a good synopsis of the facts as we know them.